I have been a teacher for 27 years, a Headteacher for 12 years and, at the age of 51, this much I know about why successful recruitment is all about cultural fit. Vision matters. Eight years ago to the week we unveiled Huntington’s Core Purpose and Vision 2018. I declared that I wanted to spend ten years helping create Vision 2018 here at Huntington. I was 43 years old; I would be 53 at the end of the 2017-18 academic year. Establishing Vision 2018 would be the core work of my career. I was here for the long-term. “In 2018 Huntington School will be a truly learning centred school which strives to nurture the creative talents of all its learners. All its systems will be designed to meet its core purpose, ‘To inspire confident learners who will thrive in a changing world’. We will have the flexibility in terms of staffing, timetabling, technology and physical resources to deliver a personalised provision for our learners, which learners help co-construct with talented staff. We will develop a range of learning and personal skills in our learners which will enable them to think independently and enjoy learning. A broad global view will permeate the curriculum and the effective use of ICT will underpin all the school’s systems. We will use the best of modern technology to inspire learning and all future decisions about new buildings will have the flexible and sustainable delivery of our provision as the guiding design principle. “In 2018 Huntington School will be a healthy, happy school where our pastoral system ensures that everyone feels safe to learn. We will be at the heart of the local community and at the centre of York’s education system, helping meet the diverse needs of learners both locally and city-wide, with the support of all our stakeholders, especially parents. Our school will be rooted proudly in its highly successful past but will be dynamic and forward looking; it will be somewhere that remembers to enjoy the experience of today. We will have a school where everyone has a clear sense of where they are now in their school careers, where they would like to go and how they are going to get there. We will ensure that all learning and teaching is informed by our own best practice, and we will be able to take innovative risks with confidence. So far, so good. The vision holds today, just as it did back in January 2008. I would probably want to add something about our practice being evidence-informed, but other than that, it seems to be where we are heading. School culture matters. As the recruitment season gets really serious – we are interviewing for four posts this week – I was reminded of a piece by Doug Lemov he wrote last summer about recruitment and cultural fit. For all of us involved in both recruiting and seeking a career move, it is an important read. 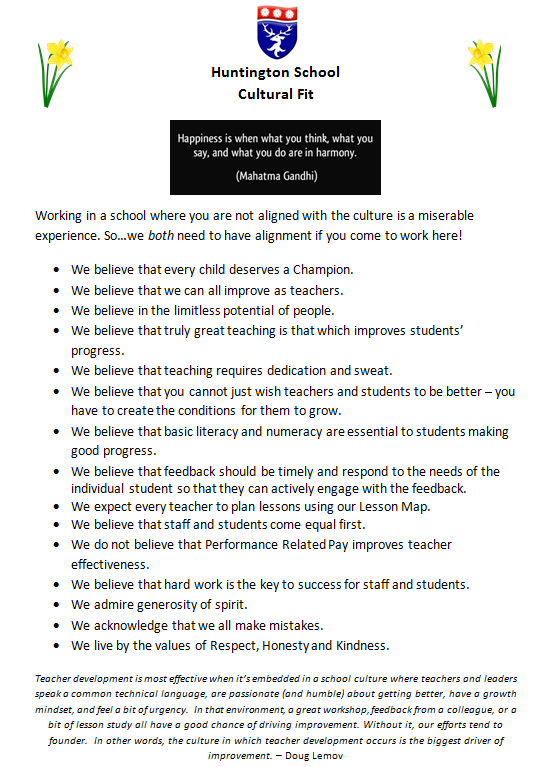 It prompted me to construct the document below, which details for our prospective candidates the core of what we believe in at Huntington. I hand it to them to read over coffee at the beginning of the interview day. As it says, if the cultural fit is not right, it will be a miserable experience for both employer and employee…during course of the day, if the candidate feels uncomfortable with what we are and what we believe in then s/he should say so and we can part friends. As Lemov writes, No one wants to spend their career at odds with the organization they work for, trying to hide from the training it offers, or watching the philosophy change every year while thinking, this too shall pass. I read this in March 2008 in my job application pack, and it’s impact is a deep and relevant to me today as it was then. The wonderful opportunity I had to work at Huntington and another personal opportunity I had at the same time forced me to choose. I’ve never forgotten the application to your school; it’s still very much with me! The decision was personal and nothing to do with school culture which I adored and which I attempt to ‘Iive’ in my current job to this day. Fortunately, the other choice I made worked out and I adore him too, and married him! So, not a regret as such, more a big ‘what if?’ Since 2008, I have sought out links, followed blogs and ‘admired from afar’ whilst applying the lessons to my practice. I might not be as literally close to the school and it’s research, but I do appreciate it! Thank you for the continued inspiration. I find your cultural fit merely reaffirms and strengthens the purpose and vision, that acknowledges the person in the professional. Your staff are very fortunate as are the students! Nice post. Indeed when I had responsibility for recruiting people in industry we used the simple general approach asking 3 questions……. 1 Can he/she do the job? 2 Will he/she do the job? 3 Wil he/she fit with the organisation?